Google Street View has revealed many things in the past what some people wanted to remain hidden. Google's effort to modernize its maps took a disturbing turn when one of their trucks for Google Street View, captured a shirtless young man pointing a gun at a street, in Detroit, Michigan. Google's camera took pictures of a man with a gun standing on the porch of the house in what seems to be the house where police found a child of 17 months old, dead in a closet under a pile of summer clothes. 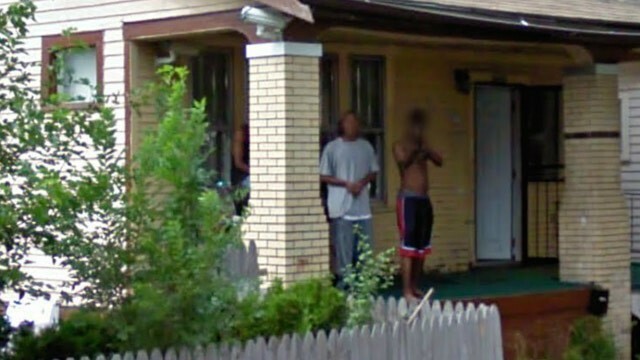 There are four other people standing behind the man with the gun, all facing the camera, which was pointed at a Google Street View mapping car. All parties on the porch look young, perhaps in their teens. The series of photos shows how everyone turns to look at the Google truck as it passed by. Ordinary or not, the death of the 17-month-old child, in what appears to be the same house on Google Street View picture still strikes a chord in the population of Detroit. According to police, it has not been determined exactly how the baby died, and no one has been charged with the death.